There are many opportunities to get involved in sustainability at Truman State University and in the Kirksville Community. Communiversity Garden: The Truman State Communiversity Garden is an organic, hand-tilled, on-campus garden dedicated to instructing members on sustainable agriculture techniques such as organic crop production, permaculture system design, seed-saving, and food preservation methods. 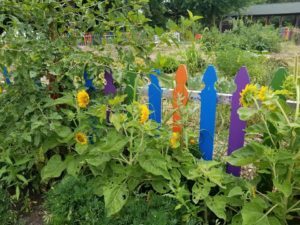 The garden serves both as a means to produce fresh, nutritious food and a teaching tool for community members that are interested in learning more about sustainable gardening. 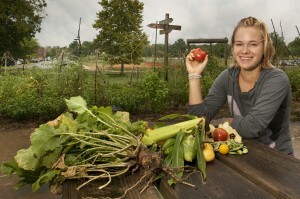 The garden also hosts a number of on-campus community events throughout the year, and partners with various on-campus and community organizations to help grow the local foods and sustainability movements in Kirksville. 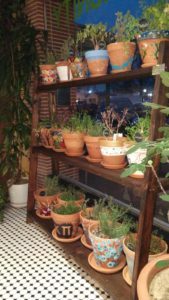 The Garden Club holds weekly meetings and garden work days through the academic year, which will vary depending upon the semester. If you would like to visit the garden, it is located in front of the Child Development Building in between West Campus Suites and the Student Recreational Center parking lot. If you are interested in learning more about the garden you can email trumancommuniverse@gmail.com or visit their website. Rot Riders: The Truman State University Rot Riders are an on-campus organization dedicated to reducing food waste in Kirksville by collecting and transporting community compost. The Rot Riders not only seek to divert usable food scraps from landfills, but pledge to do so in a carbon-free manner (on bicycles). 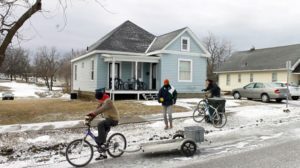 Every week, the organization rides around on bikes connected to trailers and collects food scraps from faculty, students, and local off-campus businesses. The compost is then added to community compost at the University Farm or the Communiversity Garden to nourish local community gardens the next season. The service is offered free to all campus and community members, so the organization runs entirely on volunteer support. If you are interested in learning more about the Rot Riders, please visit the organization’s Facebook page. If you are interested in getting involved with the Rot Riders or signing up to have your compost picked up weekly, send your name, phone number (optional), address, or your message to rotriders@kvpermaculture.org. Environmental Campus Organization (ECO): The Truman State University Environmental Campus Organization is a student-led on-campus organization focused on creating awareness for environmental problems, implementing green initiatives on campus, and campaigning for environmental change at the local and national level. ECO’s mission is to advocate, educate, and bring environmental concerns to the forefront of the campus and Kirksville community. Throughout the year, ECO partners with a number of other environmental organizations on-campus to host annual events such as a local foods farm-to-table dinner, a week-long celebration of sustainability undertakings on campus, and a day dedicated to water pollution issues. To learn more about what ECO does on campus and in the community, visit the organization’s website. If you are interested in getting involved with ECO, contact the current president at trumaneco@gmail.com or email faculty adviser Dr. Elizabeth Hooper at lhooper@truman.edu. PLANTS: Plant Lovers Also Need To Socialize (PLANTS) is an on-campus organization dedicated to providing opportunities for faculty and students to converse and socialize with others interested in plant biology and to further botanical interest and knowledge within the Truman community. The organization hosts biweekly meetings, pot-luck dinners, movie nights, field trips, hikes, and horticulture demonstrations. One of the main volunteer opportunities available through this organizations is the maintenance and cultivation of the Solar Clock Garden located at the south side of Magruder Hall. If you are interested in learning more about PLANTS, you can visit the organization’s website. If you would like to get involved, you can contact the organization’s president at plants.truman@gmail.com or faculty adviser Dr. Elizabeth Hooper at lhooper@truman.edu. Bulldog Biodiesel: Bulldog Biodiesel is a student-run organization that produces bio-fuel from used veggie oil donated by Truman State dining halls and local restaurants. This fuel is then used to operate University farm vehicles during the summer, fall, and spring. Students who volunteer for Bulldog Biodiesel assist in the collection, transportation, filtration, and overall production of the bio-diesel. If you are interested in learning more about the organization, you can visit their website by clicking here. If you would like to get involved, contact Student President Tina Ruidlin at tmr5156@truman.edu or Faculty Advisor Barbara Kramer at bkramer@truman.edu. Take Root Cafe: Take Root Cafe is a pay-what-you-can local foods cafe that serves healthy, delicious meals 5 days a week in downtown Kirskville. The Cafe is always looking for volunteers to help with everyday operations, which may include bussing tables, waiting on customers, cleaning counter-tops, washing dishes, or cooking meals. Recurring volunteers are encouraged, but the Cafe welcomes one-time volunteers who may be interested in seeing how the non-profit is run or would like to exchange one hour of work for a meal token. Groups of individuals and organizations may also volunteer, which could take the form of coming out for a weekly volunteer slot, organizing a fundraiser for the organization, or assisting with large events/outreach. For more information on volunteering for Take Root Cafe, visit the cafe’s website or Facebook page, or email cafe founder Jessica Parks at jessica@takerootkirksville.org. The Green Thumb Project: The Green Thumb Project is an outdoor education non-profit in Kirksville. By providing educational resources to children, parents, and community members, Green Thumb works to support and promote the local food movement. They seek to educate our community in sustainability, create more access to affordable local food for everyone, and create community gardens that will improve the health and wellness of our citizens. Scholarship job opportunities and paid summer internships are available with Green Thumb. Email gtgarden.raymiller@gmail.com to get involved. White Rose Catholic Worker Farm: White Rose Catholic Worker Farm is a intentional community organized around ecology, sustainability, and spirituality located at 31167 Ferrier Lane In La Plata, Missouri 63549. The community offers site visits, but requests that you call ahead to set up a time to visit. For more information, call (660)-332-4026. Dancing Rabbit Eco-village: Dancing Rabbit is an eco-village/intentional community located 40 minutes outside of Kirksville at 1 Dancing Rabbit Ln in Rutledge, MO 63563. The community offers a number of different workshops throughout the year, including a natural building workshop, a permaculture design course, a soap-making and herbal medicine course, and a women’s building workshop. The community also offers an online webinar series on how to live a high quality, low carbon life. Tours are offered the second and fourth Saturday of each month, with no reservation required. For more information or driving directions, click here. For other any other questions, call (660)-883-5511.